The sweetness of nougat is tempered by the slight tang of crème fraîche in this rich and nutty chilled chocolate mousse. Remove the pan from the heat and add the chocolate, stirring until it melts. Allow to cool for 5 minutes. Mix in the egg yolk and stir the mixture until it is well combined. It will be smooth except for the nuts in the nougat. Transfer the mixture to a medium-sized mixing bowl. Place the egg white in a small clean, dry mixing bowl and beat with a whisk until stiff. 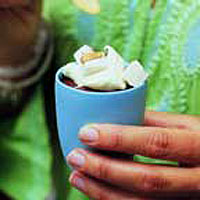 Gently fold the beaten white into the chocolate mixture and divide between 2 x 125ml ramekins. Refrigerate for 3-6 hours to allow the mousse to set. When ready to serve, top the mousses with the remaining nougat cubes and a dollop of crème fraîche.